The Redactor widgets are the elements that you can use in your documents. To use a widget, simply drag it to your document. Here are the possibilities available to you. The Heading widget allows you to insert a heading in your document, for example to separate main sections. You can choose between three levels of headings to prioritize your information. The Text widget allows you to insert full-width text in your document. This is like using a word processor. 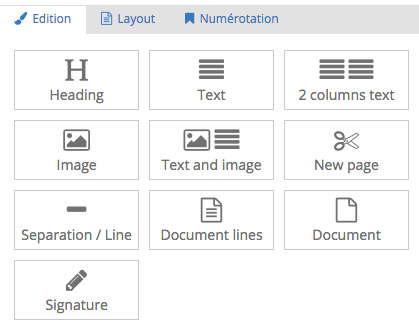 As the name suggests, the 2 columns text widget allows you to manage text in two columns. It also has dynamic variables. The image widget allows you to insert an image into the thread of your document. To download a picture or select it from your gallery, click Edit image. 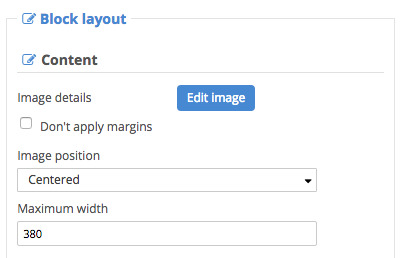 The Don't apply margins option allows you to display your image in full width on the entire document. You can also select the position of the image, and its maximum width (in pixels) to adapt the size. This widget allows you to insert a horizontal line in your document, for example to separate two sections. This widget allows you to insert the lines of a Sellsy document in your document. If you choose this widget, the lines of the relevant document are inserted into the document. This widget allows you to insert a full Sellsy document (estimate, invoice ...) in your Redactor document. The Sellsy document will be inserted where you place the widget. This widget allows you to insert a signature area in your document. You can edit the text as needed and adjust the block position. If you use the electronic signature feature, this is where your client signature will be displayed.